If you are wondering how to decorate a small living room for Christmas, you are not alone. Whether you are living in a small apartment, cabin, or a tiny house, space is a hot commodity, especially when hosting parties for the holidays. Are you ready to deck your tiny hall for Christmas? We have collected a whimsical variety of clever DIYs to make you look like a decorating genius. This project makes you look like an artistic genius – with just a few strokes of a flat brush over a drop cloth. 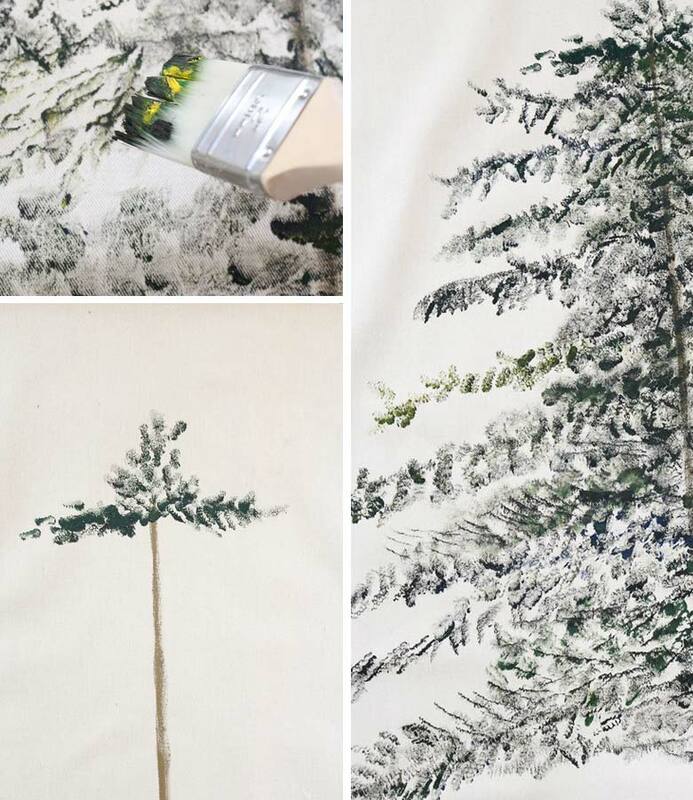 To create this masterpiece, you would need 4 colors of acrylic paint (green, brown, blue, and yellow), laminated drop cloth cut to 4-by-7-feet, a couple of painting brushes (one round, one flat), 2 wooden dowels, and a leather or cotton cord. To create this look, follow this easy tutorial. Whether you need to add texture and warmth to an empty wall or looking for a traditional Christmas tree alternative for a small space, this quick and easy DIY will bring cheer to your home and warm it up with handmade decor for years. You can easily store it by rolling up the canvas. Simply genius! Nowhere to put Christmas tree? No problem. 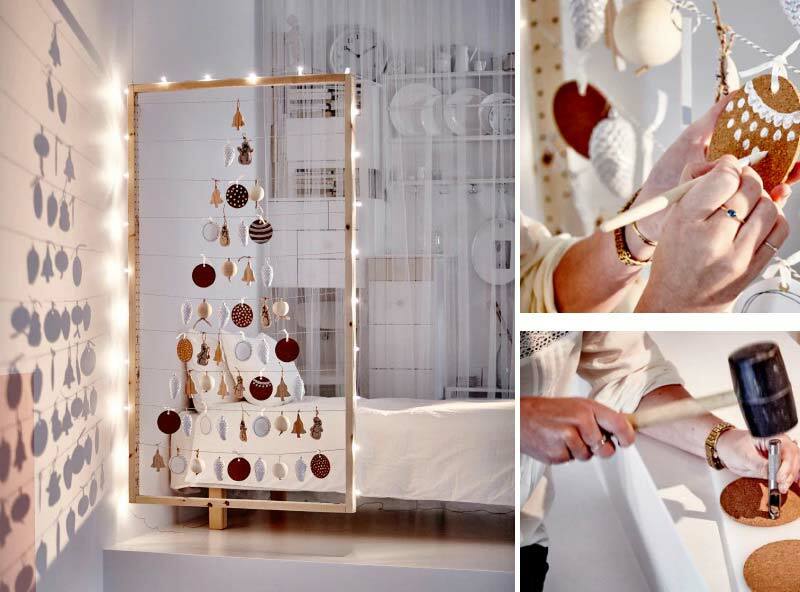 In extra tiny spaces, you can use this clever IKEA hack to fit some Christmas cheer into your living space. 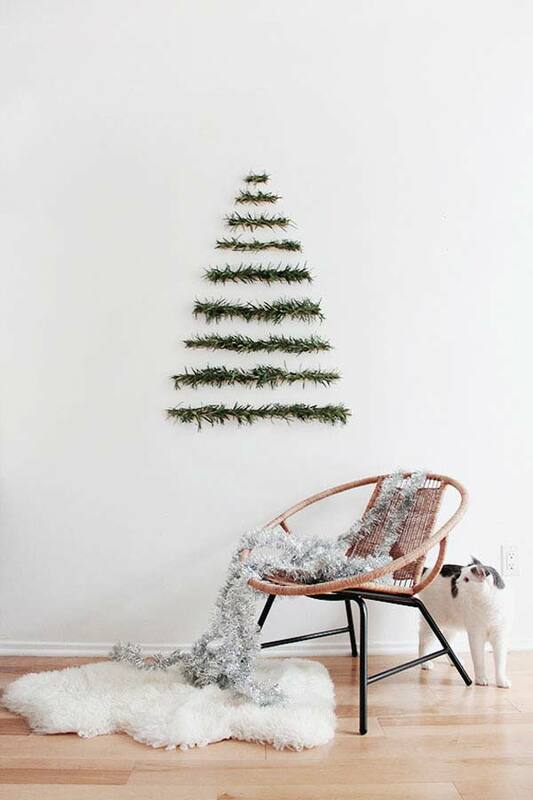 Use the side of an IVAR storage unit (or any DIY wooden rectangle) as a frame, create a ladder effect with a light string, and outline a tree shape with some of your favorite handmade ornaments. Love how this simple small space decor adds a festive flair to the opposite wall with some shadows! Some tiny home models are not considered spacious (under 400 sq.ft) but they feel airy with many windows that bring light inside. So, where to put a Christmas tree in a small living room? If you don’t have lots of space in your living area for a big traditional Christmas tree, just use window sills to display a small simple tree or two and a few candles. If you don’t have a window sill that is wide enough, just use a narrow side table. 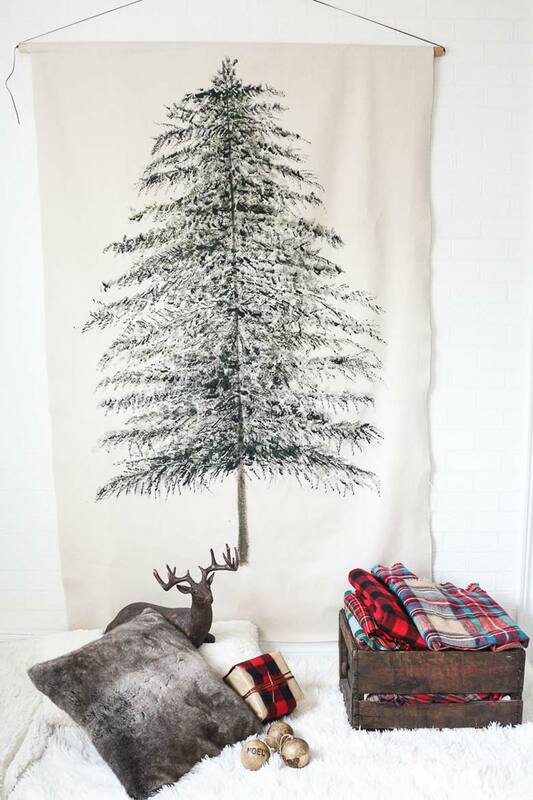 It is all about hygge and coziness this holiday season, not extravagant holiday decor, right? These snow-flocked mini trees wrapped in burlap look awesome and you can easily make them in 5 minutes or less! If you have a blank wall in your home, you can decorate for the holidays even without a traditional fresh or artificial Christmas tree. This simple string art tree tutorial is so easy, you can do it in a few minutes and ask kids to help. Just make a triangle in the shape of a tree and clip all your cards using miniature pins. Obviously, the string doesn’t have to be pink. Choose the color of your liking but make sure it gives enough contrast with the wall paint to be noticeable. It is a great way to display all the greeting cards of the season in style. This clever DIY project calls for an extra applause for a clever use of elements of nature that are there for us, free for the taking. For people who can’t have a real tree in their home, this is an alternative tree to adorn any bare wall. It is truly magical, especially when you light it up in the evening! Of course, you can hang a few ornaments on these branches too. Are you cleaning your closet before the holidays? 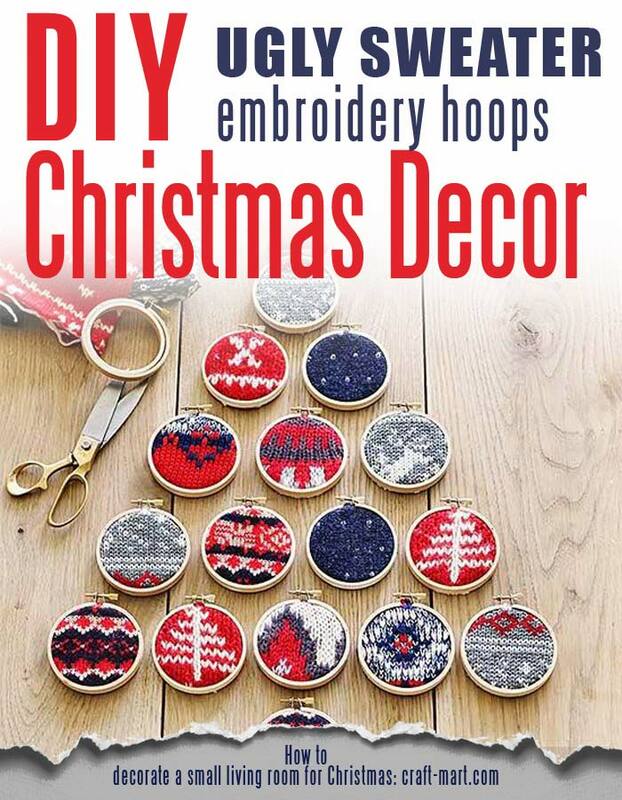 These clever embroidery hoop ornaments are such a clever way to give old ugly Christmas sweaters a new life! Simply place a small piece of a holiday sweater (the most colorful one!) in a 3-inch embroidery hoop, tighten the hoop, and trim the swatch to fit perfectly. Then hang these mini ornaments on a wall to form a triangle (or use to decorate a small tree). Genius! This is such a cute idea that every yarn aficionado would love. You, probably, have a few small colorful yarn balls leftovers that are just waiting to be used. 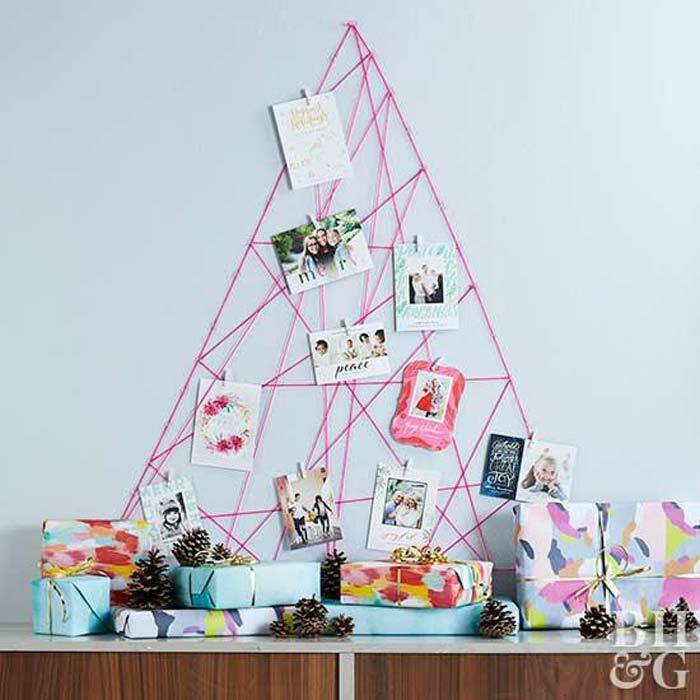 What a great idea to declutter the craft room while creating another simple DIY tree to adorn a bare wall for the holidays. You don’t need a professional pom pom maker for this craft: you can use a cardboard circle or your hands, as this helpful tutorial suggests. The fact that all pom poms are different size and color gives this whimsical tree more character. 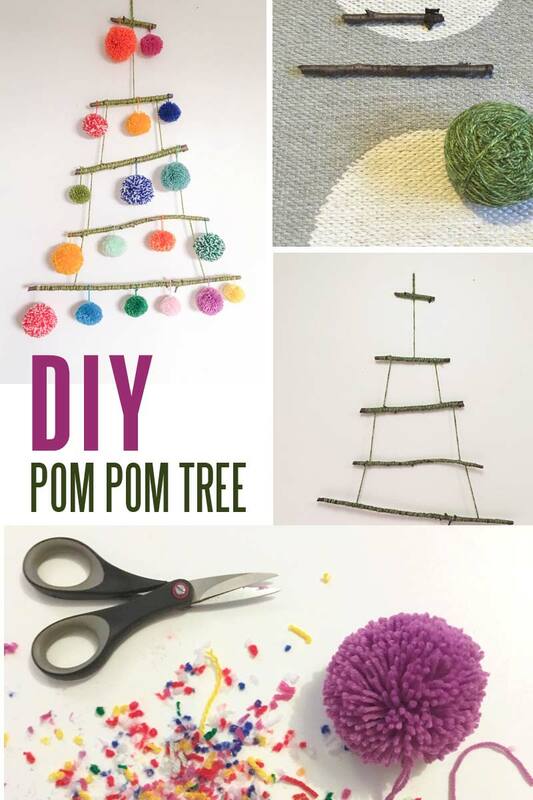 Just a few simple tree branches, pom poms made out of yarn leftovers, simple crocheted cord, and you will have your creative Christmas tree that doesn’t take any space in the house. Added bonus: use it as a kitty cat toy after the holidays. Yarn hack to decorate a small living room for Christmas at its best! The best rule to decorate a small living room for Christmas is that there should be no rules! You just use any and every space to keep it festive. 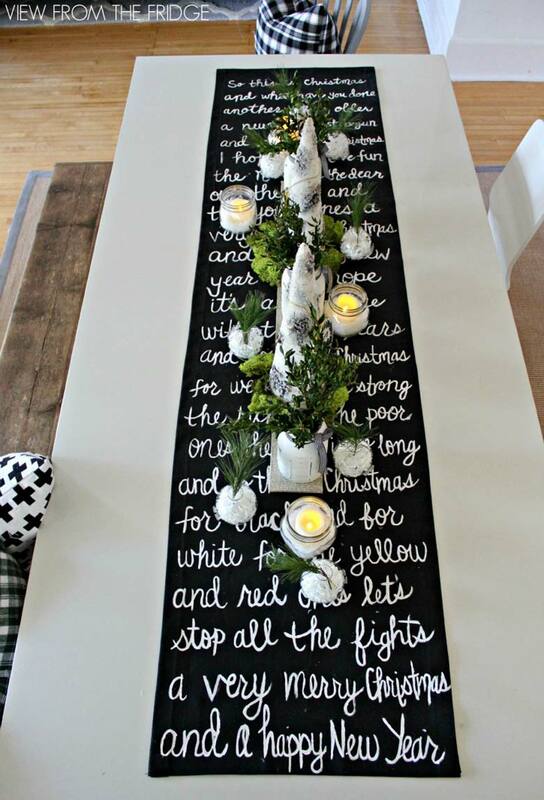 If you have a table (no matter how big or small) and plan to use it for a festive celebration, you would agree that this DIY decor idea is simply genius! Just use a black canvas to write Christmas song lyrics or a white paper to write with black marker for a reverse effect. It doesn’t have to be a perfect calligraphy piece – a little imperfection makes it more personal. This DIY project looks so simple that it doesn’t even need a tutorial. 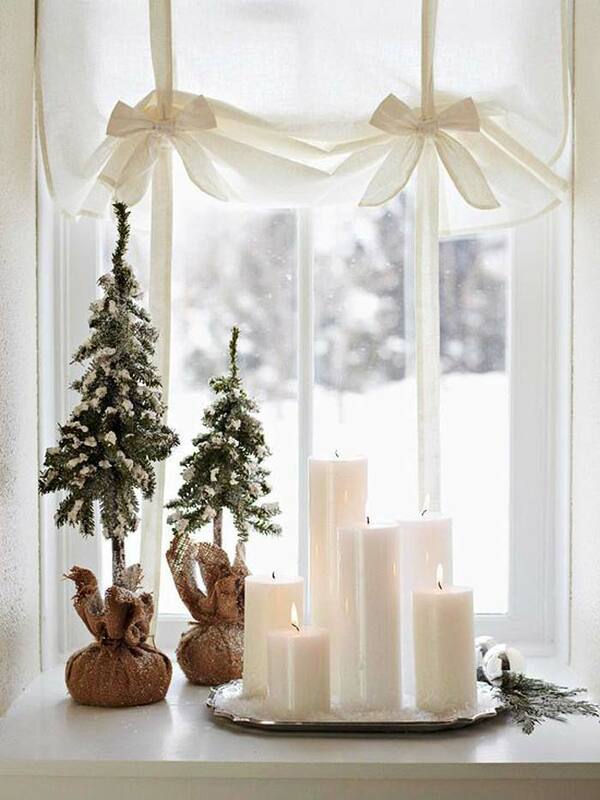 What a great way to repurpose an old garland or to decorate a small living room with fresh winter greens! You can use ether fake or fresh evergreens as long as you align them on the wall to form a triangle. This is a truly simple project to add elements of Scandinavian decor and embrace hygge this season. Natural elements, the warmth of wood, and zero cost – this is a great DIY if you want to cut your holiday spending budget. Just collect branches on your nature walks, sort them by size, drill the holes, insert a metal rod – and you have a beautiful DIY tree. You can hand the ornaments on the branches or keep it simple with just a simple wooden star on the top. No place to store it in a tiny house until next Christmas? You can always use it as firewood at the end of the season. No space for a tall Christmas tree? No problem, you can still make your tiny home cozy for the holidays! Nooks and crannies, dressers, and shelves are all great places to put a small tree if you don’t have space. You can easily decorate a small living room with a dwarf fresh or artificial tree. Use small ornaments to add whimsical and cozy decor to your tiny Christmas tree. Keep your decor simple and don’t add too many trinkets as it will crowd the space. 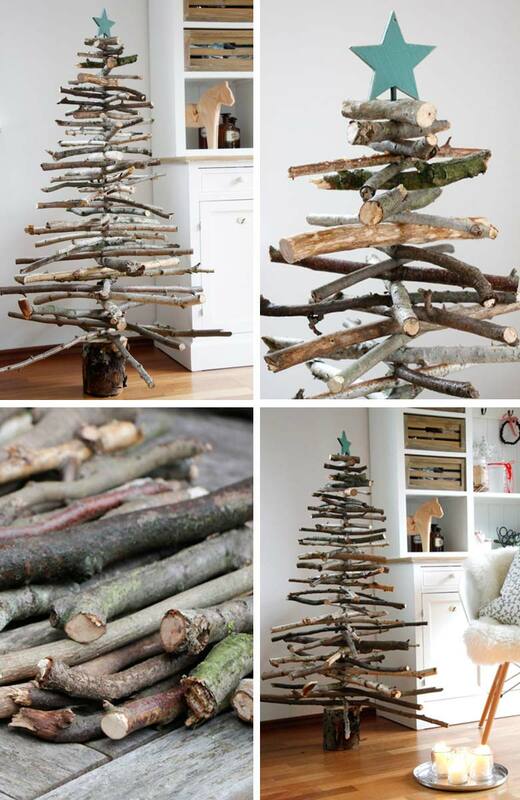 This DIY Christmas project gets a special mention for its originality. If you don’t have space at all in your small living or dining room, you can still bring the holiday cheer by decorating the chairs! One of the most rewarding things to do during the holiday season is to collect evergreen branches and make up a bounty of beautiful wreaths. These DIY festive creations are inexpensive (almost free), easy to assemble and make the perfect holiday hostess gifts or winter decoration for a small living room. You can hang them to decorate the windows, place on the table as a centerpiece, or adorn a front door. Dreaming of a black and white Christmas? 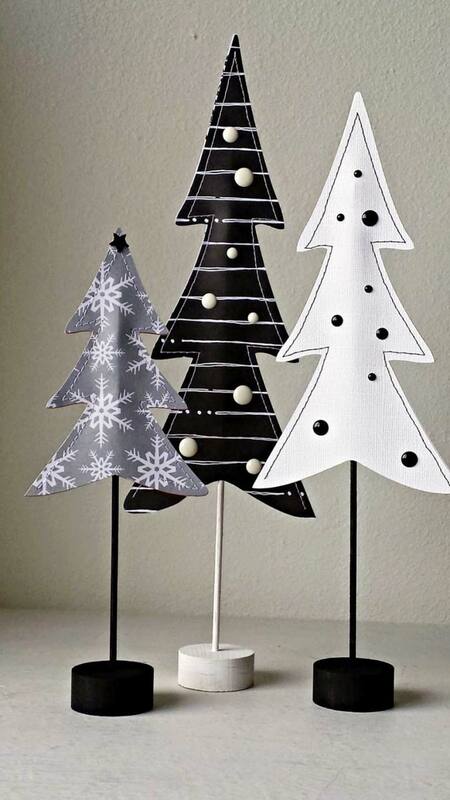 This super-simple project will help you create these trees in 3 different sizes, 6, 9 and 11.5 inches high. Just perfect for a small modern living room! Sew around the sides of each tree leaving the bottom open and use bamboo skewers and wooden discs with a small hole drilled in the center as the base. 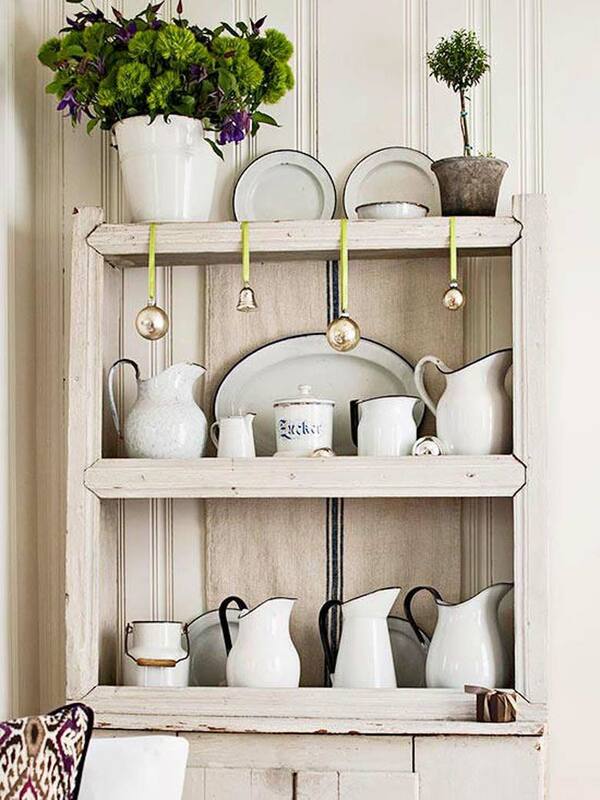 You can ‘deck the halls’ with simple Christmass ornaments hanging from kitchen open shelves or bookshelves. Pick the ribbons that match the room’s decor and adhere the hooks to the top of the furniture so they’re hidden from view. 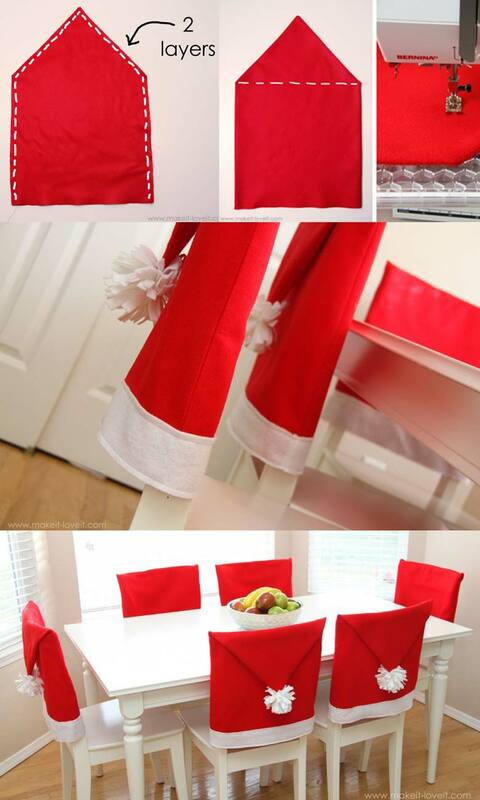 It is a quick and inexpensive way to add Christmas decor to a tiny living room or open concept space.